Storey, B.C., Vaughan, A.P.M. and Riley, T.R. The links between large igneous provinces, continental break-up and environmental change: evidence reviewed from Antarctica. Earth and Environmental Science Transactions of the Royal Society of Edinburgh, 104, 1-14, 2013. Earth history is punctuated by events during which large volumes of predominantly mafic magmas were generated and emplaced by processes that are generally accepted as being, unrelated to “normal” sea-floor spreading and subduction processes. These events form large igneous provinces (LIPs) which are best preserved in the Mesozoic and Cenozoic where they occur as continental and ocean basin flood basalts, giant radiating dyke swarms, volcanic rifted margins, oceanic plateaus, submarine ridges, and seamount chains. The Mesozoic history of Antarctica is no exception in that a number of different igneous provinces were emplaced during the initial break-up and continued disintegration of Gondwana, leading to the isolation of Antarctica in a polar position. The link between the emplacement of the igneous rocks and continental break-up processes remains controversial. The environmental impact of large igneous province formation on the Earth System is equally debated. Large igneous province eruptions are coeval with, and may drive environmental and climatic effects including global warming, oceanic anoxia and/or increased oceanic fertilization, calcification crises, mass extinction and release of gas hydrates. This review explores the links between the emplacement of large igneous provinces in Antarctica, and the isolation of Antarctica from other Gondwana continents during the Mesozoic and Cenozoic. One of the intriguing aspects of the geological evolution of Antarctica is the large volume of intracontinental igneous rocks that were emplaced during the Mesozoic and Cenozoic. This is in marked contrast to the Palaeozoic which was almost devoid of intracontinental igneous activity and during which time Antarctica was located almost centrally within Gondwana. The emplacement of the Mesozoic igneous provinces was contemporaneous with the gradual breakup and disintegration of Gondwana, leading eventually to the isolation of Antarctica in a south polar position. What is even more notable is that Antarctica itself continued to rift after it was isolated in its south polar position, forming the West Antarctic Rift System (Behrendt et al. 1991), with emplacement of related igneous rocks. The link between the emplacement of the igneous rocks in Antarctica, rifting and continental breakup processes remains enigmatic (Storey 1995; Rosenbaum et al. 2008). The potential link between large igneous provinces and plate tectonic processes has been considered because many of the Mesozoic provinces were located close to once active plate boundaries and continental margins. Alternatively, the magmatic pulses responsible for producing large volumes of igneous rock in relatively short periods of time have also been related to some form of internal heating (thermal anomaly) in the Earth’s mantle due either to the insulation of the Gondwana supercontinent (e.g., Gurnis 1988; Coltice et al. 2007), or a mantle-sourced thermal upwelling, i.e., mantle plume (Morgan 1971, 1981, Richards et al. 1989). Mantle plumes may either have caused the continents to rift and break up (active mantle hypothesis, Morgan 1971) or have been unroofed by chance due to plate tectonic processes causing continental break-up (passive mantle hypothesis, White & McKenzie 1989). Although the Gondwana magmatic provinces are mainly mafic in composition, large silicic provinces also exist, part of which are present in Antarctica (Pankhurst et al. 1998). This article will review the connections between the emplacement of the large igneous provinces in Antarctica formed during the Mesozoic and Cenozoic and the relationship of these to the break-up of Gondwana. A central question is whether these huge manifestations of basic magmatism were associated with notable positive thermal anomalies in the subcontinental upper asthenospheric mantle (e.g., Richards et al. 1989; White & McKenzie 1989; Johnston & Thorkelson 2000; Thompson & Gibson 2000; Coltice et al. 2007) or whether they formed by decompression melting related to plate tectonic processes (e.g., King & Anderson 1995; Anderson 2000, 2005; Elkins-Tanton 2005; Foulger 2007). For this reason, petrogenetic models for the formation of the igneous provinces are reviewed. The article will also consider the impact of the formation of the igneous provinces on the Earth System in general. Large igneous province eruptions implicated in environmental and climatic changes including global warming, oceanic anoxia and/or increased oceanic fertilization, calcification crises, mass extinction and potentially the release of gas hydrates (Hesselbo et al. 2000; Wignall 2001; Wignall et al. 2005). Although the volume of igneous rocks emplaced during the Mesozoic and Cenozoic evolution of Antarctica, in some cases may not strictly be of sufficient volume to be classified as large igneous provinces (LIPs), nevertheless they are included here as they are clearly related to Gondwana rifting and subsequent breakup. We first present details of the Antarctic igneous provinces including their petrogenesis and then consider their links to continental break up processes. Central to the debate concerning the origin of any LIP is establishing whether a mantle plume source existed and determining whether the role of the plume was restricted to conductive heat transfer to the lithosphere, or whether uncontaminated plume-derived magmas were erupted at the surface or intruded at upper crustal levels. The Middle Jurassic (180.3 ± 2.2 Ma; Heimann et al. 1994) Ferrar magmatic province in Antarctica is predominantly a mafic sill complex but includes flood basalts (Elliot et al. 1999), phreatomagmatic volcanic rocks (Elliot & Hanson 2001), mafic dykes (Fleming et al 1992; Leat et al. 2000) and layered mafic intrusions (Storey & Kyle 1997). It has a linear outcrop and extends 3500 km from the Theron Mountains of Antarctica to southeast Australia (Fig. 1) (Elliot & Fleming 2004). Its linear outcrop pattern is unusual among LIPs, but the extent to which the elongate outcrop is a function of ice-cover limiting the outcrop is uncertain (Leat 2008) and there is geophysical evidence indicating a greater extent of Ferrar province rocks under the East Antarctic Ice Sheet (Ferraccioli et al. 2001). Its main outcrops are in Antarctica (Kyle 1980; Kyle et al. 1981), but it also occurs in southeast Australia, (Hergt et al. 1989a,) New Zealand (Mortimer et al. 1995), and South Africa (Riley et al. 2006). The total volume of lava and intrusions in the Ferrar Province is estimated to be around 200 000 km3, allowing 60 000 km3 for the Dufek-Forrestal intrusions, 125 000 km3 for sills, lavas and dykes in Antarctica, and 15 000 km3 for sills in Tasmania (Hergt et al. 1989a; Elliot & Fleming 2000). This is a considerable reduction from early estimates of 500 000 km3 (e.g. Kyle et al. 1981), following a reinterpretation of the extent of the Dufek and Forrestal intrusions based on aeromagnetic surveys (Ferris et al. 1998). Figure 1. 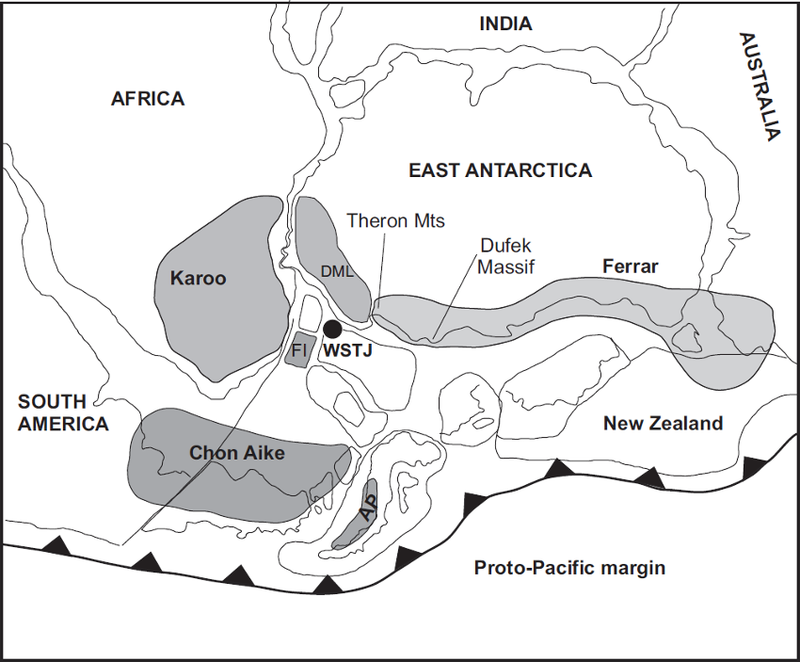 Middle Jurassic Gondwana reconstruction showing three large igneous provinces (after Storey & Kyle 1997); Ferrar, Karoo and Chon Aike, and the location of the Weddell Sea Triple Junction (WSTJ) after Elliot & Fleming 2000. DML, Dronning Maud Land; FI, Falkland Islands. As a result of detailed 40Ar/39Ar and U–Pb geochronology the synchronicity of the Ferrar and Karoo province in southern Africa has long been recognized (e.g. Encarnacion et al. 1996; Palfy & Smith 2000; Riley & Knight 2001) although the peak (based on a compilation of age dates) of Karoo magmatism at 183 ± 2 Ma is 3 Myr older than the Ferrar peak of 180.3 ± 2.2 Ma. Although closely spaced in time, the rocks of the Ferrar and the Karoo volcanic provinces are markedly different in their geochemistry. The basalts of the Ferrar province are entirely of low-Ti–Zr type and are typically high SiO2 compared to the once neighbouring Karoo province (Fig 2). Other key features of the Ferrar Province are Sr and Nd isotope ratios, with Ferrar basalts having initial (87Sr/86Sr)180 ratios in the range 0.708 – 0.711 and εNd180 values in the range -2 to -8 (Fig. 3). These isotopic characteristics of the erupted rocks of the Ferrar province, coupled with the high SiO2 (50 – 52 wt%) and high concentrations of the large ion lithophile elements have led several workers (e.g. Antonini et al. 1999) to suggest that processes involving contamination of the magmas by continental crust was important whilst other workers (e.g. Kyle 1980; Hergt 2000) maintain that the continental crust was not involved in the petrogenesis of Ferrar magmas. Molzahn et al. (1996) suggested that their ‘mantle-like’ Os isotope ratios and that their radiogenic 87Sr/86Sr is a characteristic of their mantle source. Figure 2. 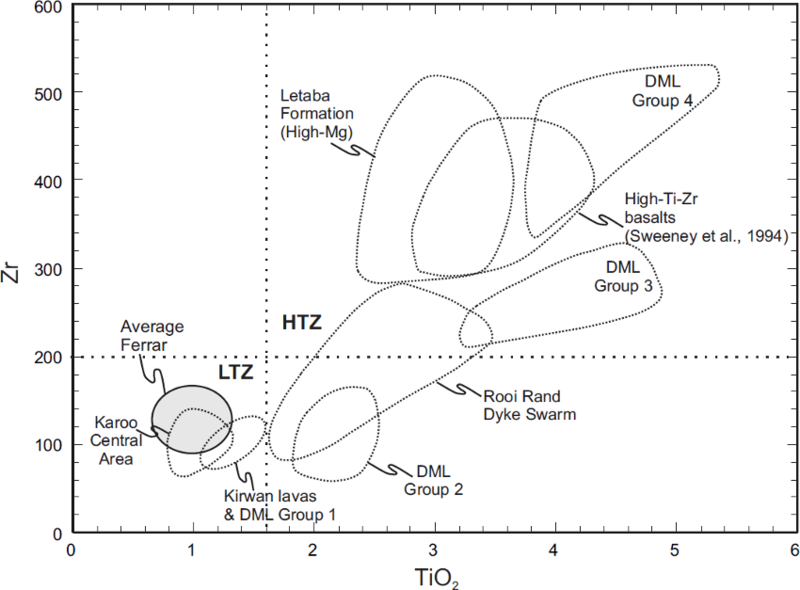 Variation in Zr vs TiO2 for dyke and lava compositions from the Karoo (Kirwan lavas, Karoo central area, Rooi Rand dyke swarm, Letaba Formation, Lebombo high Ti-Zr basalts) and Dronning Maud Land provinces (DML groups 1-4) and average Ferrar compositions. Data sources in Riley et al. (2006). HTZ, high Ti zone; LTZ, low Ti zone. Figure 3. Initial eNd and 87Sr/86Sr for intrusive rocks and lavas from the Karoo and Ferrar magmatic provinces. All data sources are available in Riley et al. (2006). All data are normalized to an initial value at 180 Ma. F.I. Falkland Islands; ODS, Okavango dyke swarm. The linear outcrop pattern of the Ferrar magmatic province, sub-parallel to the proto-Pacific margin of Gondwana (Fig. 1), has led some workers (e.g. Hergt et al. 1991) to attribute the chemistry of the Ferrar magmas to enrichment of their mantle source material by subduction-derived fluids. For the most part, the outcrop pattern follows the subduction related Cambro-Ordovician Ross Orogen and is sub parallel to the active Mesozoic continental margin, although geophysical data (Ferraccioli et al. 2001) provides evidence for Ferrar magmatic rocks more than 500 km from the margin, beneath the Wilkes Subglacial Basin (Fig. 4), making a subduction-related origin less likely. Cox (1988), however, attributed the linear outcrop pattern to a similar-shaped heat source that he referred to as a “hot line”. Elliot et al. (1999) and Storey and Kyle (1997) suggested the Ferrar magmas originated from a single magmatic centre and that the present-day outcrop is the result of long distance magma transport from this point source in sills or dykes. Elliot and Fleming (2004) suggested that magma transport was ultimately controlled by an active rift system initiated in the Early Jurassic and that the point source for the magmas was a thermal anomaly (mantle plume) at the Weddell Sea triple junction (Fig.1) (Elliot & Fleming 2000), which was also adjudged to be responsible for the Karoo low-Ti basalts of southern Africa. Figure 4. 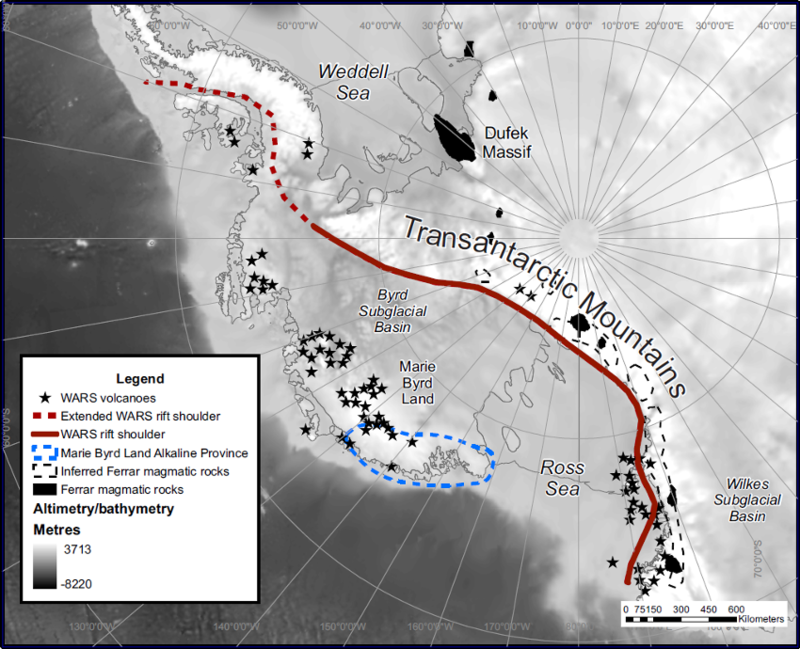 Antarctic map showing the Transantarctic Mountains as the rift shoulder of the West Antarctic Rift System (WARS), the related Cenozoic alkaline magmatic province (WARS volcanoes), the outline of the Middle Jurassic Ferrar magmatic province and the outline of the mid Cretaceous alkaline magmatism in Marie Byrd Land. Magmatic rocks of the geochemically distinct Karoo magmatic province of Southern Africa are found in the once neighbouring western Dronning Maud Land sector of Antarctica (Fig. 1). Although for the most part geographically separate, Brewer et al. (1992) identified both Karoo- and Ferrar-like rocks in the Theron Mountains of Coats Land, Antarctica (Fig. 1). In western Dronning Maud Land Karoo magmatic activity appears to have been less intense. Flood basalt lava sequences are thinner (<1 km thickness; Luttinen & Furnes 2000) than their southern African equivalents, which are at least 1600m in Lesotho (Marsh & Eales 1984). Mafic dyke suites are also on a much smaller scale with widths typically <2m (Riley et al. 2005). The geochemistry of the Karoo igneous rocks has been interpreted to indicate derivation from an enriched lithospheric mantle source (e.g. Erlank 1984) with or without crustal contamination. Others have proposed that the Karoo magmas were partial melts of a mantle plume source that were subsequently contaminated by lithospheric mantle components (Cox 1992; Ellam et al. 1992; Sweeney et al. 1994). The presence of ferropicrite and picrite dykes, together with other geochemical and isotopic evidence, indicates that the magmas comprising many of the Dronning Maud Land dykes were formed at depth (at least garnet lherzolite stability) as a result of anomalously high temperatures (>1500°C), indicative of mantle plume derivation (Riley et al. 2005). Although ferropicrites may not represent a volumetrically significant magma type, the OIB-like geochemistry and the inferred high temperatures of the ferropicritic primary melts (e.g. Gibson et al. 2000; Heinonen & Luttinen 2008, 2010) strongly suggest a plume source for the Karoo LIP (cf. Riley et al. 2005), and contribute to the debate on the nature of hotspots and the existence of mantle plumes and their significance as sources of LIP magmatism (e.g. Foulger et al. 2005). Strongly depleted magma types are also a key component of the early Karoo intrusive (Riley et al. 2005; Heinonen et al 2010). Such MORB-like compositions (87Sr/86Sr: 0.7035, εNd: -8; Fig. 3) have been recognized from several other LIPs (e.g. Siberian Traps, Wooden et al. 1993; Etendeka Province, Gibson et al. 2000) and are considered to be a key component of mantle plumes (e.g. Kerr et al. 1995). Heinonen et al. (2010) suggest their findings are more concordant with a model (Coltice et al. 2009) that suggests the generation of the Karoo magmas in an extensive melting episode caused by internal heating of the upper mantle beneath the Gondwana supercontinent. On the other hand, anisotropy of magnetic susceptibility measurements indicates the presence of a regional scale radial stress system in western Dronning Maud Land, supporting a mantle plume origin for the Karoo large igneous province (Curtis et al. 2008) and Heron and Lowman (2011) suggest that internal heating models are not feasible. The recognition of silicic large igneous provinces in the geological record (e.g. the Etendeka-Parana (Bryan et al. 2010)) has led to the reassessment of many continental margin volcanic provinces worldwide (Bryan et al. 2002). The Chon Aike province (Fig. 1) of Patagonia extends from the Atlantic Coast to the Chilean side of the Andes (Pankhurst et al. 1998) and is correlated with the Jurassic silicic volcanic rocks of the Antarctic Peninsula (Riley & Leat 1999; Riley et al. 2010). In eastern Patagonia, the volcanic rocks are predominantly flat lying and undeformed where they overlie crystalline basement rocks of Precambrian to earliest Jurassic age and Lower Jurassic, rift-related sedimentary rocks. In contrast, silicic volcanic rocks of the Andean Cordillera form relatively narrow outcrops, which are locally deformed, tilted, and strongly affected by hydrothermal alteration. The province is dominated by phenocryst-poor ignimbrites, derived from multiple caldera centers (e.g. Aragón et al. 1996; Riley & Leat 1999), and vary in degree of welding from high grade rheomorphic ignimbrites with parataxitic textures, to the volumetrically dominant, non-welded, lithic-rich ignimbrites. Volumetrically minor rhyolite lavas, air fall, debris flow, and epiclastic deposits also occur. The province is geochemically bimodal, but is dominated by rhyolite, with only rare examples of intermediate (basaltic andesite and/or andesite) compositions (Riley et al. 2003a). The eruptive ages of silicic volcanic rocks from Patagonia and the Antarctic Peninsula defined by U-Pb ion microprobe dating (Pankhurst et al. 2000) and 40Ar/39Ar geochronology (Féraud et al. 1999; Pankhurst et al. 2000) indicate that volcanism continued for as long as 30 Myr, from the Early Jurassic to Late Jurassic, but occurred in three main phases. The first phase of volcanism (188–178 Ma; V1 of Pankhurst et al. 2000) has a peak eruptive age of 184 ± 2 Ma, and brackets the peak of flood basalt volcanism of the Karoo and Ferrar provinces at 183 ± 1 Ma (e.g. Encarnación et al. 1996). Volcanic rocks of the V1 group occur in the eastern part of the region (Marifil Formation) and at the southern Antarctic Peninsula (Mt Poster Formation, Rowley et al. 1982; Brenneke Formation, Wever & Storey 1992). The V2 episode crops out in the central and western parts of the Chon Aike Province and widely across the north eastern Antarctic Peninsula (Mapple Formation, Riley & Leat 1999; Riley et al. 2010). V2 has a peak eruptive age of 169 ± 2 Ma (Pankhurst et al. 2000). The Tobífera Formation of southernmost Patagonia, however, yielded ages of 178 and 171 Ma (Pankhurst et al. 2000) and may partly span the interval between V1 and V2 (172–162 Ma). The final episode, V3 (157–153 Ma), is confined to the Andean volcanic outcrops of Argentina and Chile, although small granite bodies of this age occur both in western Patagonia and in the western Antarctic Peninsula, and maybe subvolcanic equivalents. Figure 5.. Nb-Y discrimination plots for silicic rocks from the Antarctic Peninsula and Patagonia. The fields characteristic of within plate granites (WPG), ocean ridge granites (ORG), and volcanic arc/syncollisional granites (VAG + SYN-COLN) are those defined by Pearce et al. (1984). A Middle Jurassic (173±3 Ma) intracontinental granitic suite was identified within West Antarctica by Storey et al. (1988) varying in composition from A-type granites to crustal melts. The A-type granites were modeled as having being derived by closed system differentiation of a Ferrar mafic magma with varied degrees of crustal contamination. They may represent plutonic equivalents of the silicic volcanic rocks of the Chon Aike province (V2). The fundamental reason that a large silicic province formed in southern South America, in contrast to the synchronous mafic provinces in the interior of Gondwana was due to the presence of a fertile crustal source close to the continental margin (Bryan et al. 2002). Large degrees of crustal partial melting, essential to produce the large volumes of rhyolitic magma, are controlled by the water content and composition of the crust and the large thermal input from the mantle. Although the thermal budget for mafic and silicic large igneous provinces is considered the same (i.e. a large thermal input), hydrous crustal material is more receptive to melting, and will begin to melt at lower temperatures (Bryan et al. 2002). Ancient and active convergent margins tend to be characterized by a fertile, hydrous lower crust that can readily melt. Long-lived subduction promotes the development of a hydrated lower crust and lithospheric mantle that can extend for several hundred kilometres from the active margin (e.g., Karoo, western United States; Fitton et al. 1988; Davis et al. 1993), particularly if significant lateral accretion has occurred over time. The silicic melts can also act as a density barrier, preventing the mafic magmas from reaching the surface (cf. Huppert & Sparks 1988), as will a lack of deep, crust-penetrating structures that can transfer mafic magma to the surface. Mid-Cretaceous igneous rocks of central Marie Byrd Land (Fig. 4) in Antarctica, and on the formerly neighbouring Campbell Plateau, record a rapid change from subduction-related to rift-related magmatism (Weaver et al. 1994). This correlates with the final stages of subduction of the Phoenix plate and the subsequent rifting of New Zealand from West Antarctica prior to opening of the Southern Ocean. The subduction related igneous suite is calc-alkalic I-type diorites, granodiorites and monzogranites (108-124 Ma). Rift magmatism produced diverse A-type granitoids (monzonites, syenites, syenogranites, and alkali feldspar granites; 95 to 102 Ma) and mafic plutons, dykes and sills (107± 5 Ma) of continental flood basalt affinity. The mafic dyke suites have been modeled by mixing between tholeiitic asthenosphere derived OIB with a HIMU composition and alkaline lithospheric mantle derived alkaline magmas (Storey et al. 1999). It has been suggested that rifting was caused by changes in plate boundary forces, however Weaver et al. (1994) have suggested that mantle plume activity may have begun in mid-Cretaceous time, triggering melting of the lithosphere and controlling the locus of rifting. A mantle plume hypothesis is supported by evidence of 0.5–1.2 km excess topographic elevation for West Antarctica and adjacent sea floor, and by evidence of anomalously high subsidence rates on Campbell Plateau in the Palaeogene as it and New Zealand rifted away from a zone of mantle upwelling on the West Antarctic margin (Sutherland et al. 2010). A belt of Cenozoic alkaline magmatic rocks (48 Ma to presently active) lies within a broad region of extended crust known as the West Antarctic Rift System or WARS (Fig. 4) (LeMasurier 1990; Behrendt et al. 1991). The Cenozoic extension is characterized by thin-crust approximately 20–30 km thick, deep-rift basins within the Ross Sea region and Marie Byrd Land (Behrendt et al. 1991) and significant uplift along the 3500 km long, 4500 m high Transantarctic Mountain front which separates the rift from the East Antarctic shield (ten Brink et al. 1993). The West Antarctic Rift System is marked by a topographic trough 750 to 1000 km wide and 3000 km long, running from near the Ellsworth-Whitmore Mountains to the Ross Embayment-northern Victoria Land (Fig. 4) (LeMasurier & Thomson 1990; Behrendt et al. 1991, 1992). The WARS is similar in size to the East African rift system and to the Basin and Range province of the western United States (Tessensohn & Worner 1991) and is geometrically asymmetric. The eastern flank in Marie Byrd Land is characterized by basin-and-range style of topography with about 3 km of uplift in the central part (LeMasurier & Rex 1989). The opposite flank in northern Victoria Land (NVL) consists of the Transantarctic Mountains, the uplifted roots of the early Paleozoic Ross Orogen (Stump 1995). Eighteen major alkaline volcanoes and many smaller centers are found within the Marie Byrd Land province (Fig. 4). The volcanoes are large, mostly 3000 m in height, and are composed pre- dominantly of felsic alkaline lavas, phonolite, trachyte, rhyolite and intermediate differentiates. Smaller basaltic centers composed of alkali basalt, basanite and hawaiite are also present and are common as parasitic vents and basal flows at the larger volcanoes. The majority of the large composite volcanoes in Marie Byrd Land are found in linear chains that become progressively younger towards the perimeter of the province. The pattern of volcanism has been explained by the sequential release of magmas from shallow chambers along a propagating relict fracture system reactivated during Cenozoic extension (LeMasurier & Rex 1989; Panter et al. 1994). In Northern Victoria Land, Cenozoic bimodal plutons with gabbroic and syenitic portions, and alkali basalt-basanite-tephrite dykes are some of oldest parts of the province dating back to 48 Ma (Rocchi et al. 2002). Large volcanic edifices, present in the McMurdo Sound region near Ross Island are basaltic shield volcanoes, stratovolcanoes with dominant trachytic and phonolitic compositions, and small, isolated basaltic scoria cones and lava flows. The alkaline basalts have similar trace-element concentrations and isotope ratios that approach the HIMU compositions of oceanic islands (Hofmann, 1997). The origin of the extreme HIMU signature has been attributed to recycling of ancient oceanic crust within plumes rising from the deep mantle (Hofmann & White 1982; Hart et al. 1992). Geochemical studies of basalts from the West Antarctic rift support plume-related sources for volcanism (Hart et al. 1995, 1997; Rocholl et al.1995). Plume models have also been used to explain tectonic doming and the spatial pattern of volcanic centers within the Marie Byrd Land province (LeMasurier & Rex 1989; Hole & LeMasurier 1994; LeMasurier & Landis 1996). Some models appeal to a single young ‘active’ plume concurrent with the onset of volcanism 28–35 Ma ago (Kyle et al. 1994; LeMasurier & Landis 1996) while others favor a passive model involving a ‘‘fossilized’’ plume head fixed at the base of the lithosphere (Rocholl et al. 1995; Hart et al. 1997). In the fossil plume model, the arrival of a plume head prior to the mid-Cretaceous breakup of New Zealand from Antarctica may explain the extremely broad distribution (over 5000 km) and significant age-span (100 Ma) of HIMU-type alkaline volcanism found throughout the continental borderlands of the southwest Pacific (Lanyon et al. 1993; Hart et al. 1997; Panter et al. 1997a). 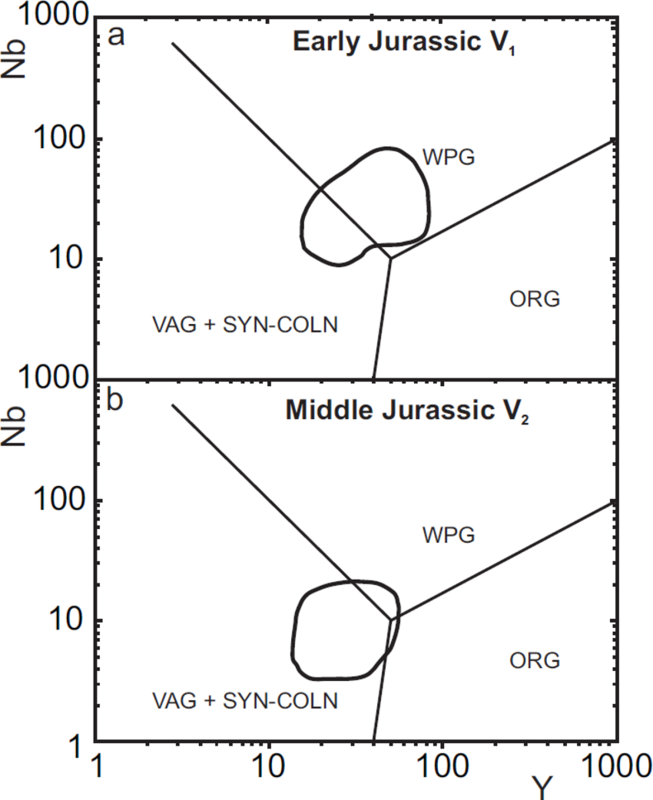 Magmatism associated with either Jurassic; 184 Ma (Encarnacion et al. 1996) or Cretaceous; 100 Myr (Weaver et al. 1994) rifting events may signal early plume–lithosphere interaction. Seismic tomography (Spasojevic et al. 2010) and subsidence data (Sutherland et al. 2010) support evidence for a very long-lived deep mantle thermal anomaly off West Antarctica, probably triggered by cessation of subduction along the Gondwana margin. Panter et al. (2000) proposed a variant on the fossil plume model; one that calls upon a Cretaceous plume composed solely of the HIMU component overlain by a much more extensive pre-existing metasomatised layer within the Gondwana lithosphere. The plume-driven metasomatism may have been related to the Jurassic Bouvet-plume having enriched the Gondwana lithosphere in highly incompatible trace-elements. The plume-modified lithosphere was then underplated by a smaller HIMU-plume in mid-Cretaceous times. A Cretaceous plume-head with a diameter of 600 to 800 km would encompass these HIMU localities prior to continental breakup. Extension and rifting of New Zealand from Antarctica would have lead to adiabatic decompression melting of the fossil plume and overlying plume-modified lithosphere within widely dispersed fragments of the former Gondwanaland supercontinent. Finn et al. (2005) reviewed the different tectonic models and concluded that the diffuse alkaline magmatic province in the south west Pacific of which the Antarctic Cenozoic alkaline province is a part, was formed by sudden detachment and sinking of subducted slabs in the late Cretaceous that induced instabilities along the former Gondwana margin that in turn triggered lateral and vertical flow of warm Pacific mantle. According to Finn et al. (2005) the combination of metasomatised lithosphere underlain by mantle at slightly elevated temperatures was key to generating Cenozoic magmatism. Alternative interpretations to both plume-driven and passive rifting have been proposed by Rocchi et al. (2002, 2003, 2005), which suggest that magma genesis and emplacement is due to the reactivation of pre-existing NW-SE translithospheric faults (Salvini et al. 1997), which promoted local decompression melting of an enriched mantle previously veined during a Late Cretaceous amagmatic extensional rift phase. Having summarized the main features and petrogenesis of the large igneous provinces the next section reviews the tectonic processes that may have contributed to Gondwana breakup and formation of the igneous provinces. The parallelism of the current exposure of the Ferrar province to the active margin of Gondwana and to the Permo-Triassic Gondwanian fold belt has inevitably drawn attention to the role of plate margin processes in the initial mid Jurassic breakup of Gondwana (Storey 1995), as has their broad calc alkaline geochemistry (Hergt et al. 1989b). Gondwana may have been pulled apart by plate boundary processes operating on either side of the supercontinent to form back arc basins and rift zones akin to the formation the Rocas Verdes in late Jurassic times (Dalziel et al. 1974) although recent modelling suggests that this process is complex and many aspects of it are not well understood (Mikhailov et al. 2010; Siddoway 2010; Ghosh & Holt 2012). A similar plate margin model can also be used to explain the mid-Cretaceous alkaline province in Marie Byrd Land. Marine geophysical studies have shown that approaching spreading ridges stalled close to the active margin causing the potential transfer of Marie Byrd Land to the Pacific plate and back arc rifting (Luyendyk 1995). In 1963 Wilson (1963) first suggested that the Hawaiian Islands were produced by oceanic lithosphere moving over a stationary “hot spot” in the mantle, and in 1971 Morgan (1971) suggested that lower mantle plumes exist in the Earth’s mantle and may play an important role in convection and continental break-up. However, there has been considerable recent debate recently about the existence of lower mantle plumes (Foulger et al. 2005) with a variety of thermal plumes (Davies & Bunge 2006; Wilson & Dowes 2006; King & Ritsema 2000) having been described as focused vertical upwellings that are not directly rooted in the lower mantle, as predicted by the original hotspot model (Morgan 1971). Moreover, high-resolution seismological images have shown many apparent small-scale convective heterogeneities in the uppermost mantle at margins such as the western US (e.g. Sigloch et al. 2008; West et al. 2009) and the Mediterranean (Faccenna & Becker 2010). Subcontinental small-scale convection may be initiated by sharp temperature gradients at a craton’s edge, where decompression melting may cause volcanism (King & Anderson 1995). An indirect connection to slab return flow, which may interact with a hydrated layer in the transition zone to facilitate localized upwellings along active plate margins has also been suggested (Leahy & Bercovici, 2007; Faccenna et al. 2010; Rey & Mueller 2010). However, in addition to indications from geoid anomalies, the presence of long-lived thermal anomalies in the mantle has been demonstrated by seismic velocity distribution models based on tomographic techniques using both P- and S-waves (e.g. van der Hilst et al. 1997; Montelli et al. 2004; Montelli et al. 2006; Steinberger & Torsvik 2012). Large low velocity seismic anomalies have been detected in the Earth’s lower mantle at the core-mantle boundary beneath Africa and the Pacific Ocean with the chemically distinct sub-Pacific and sub-African large low shear velocity provinces (LLSVPs) becoming a robust feature (Fig. 6) (Wang & Wen 2004; Steinberger & Torsvik 2012). Density heterogeneities, imaged using seismic tomography, contain information about time dependent mantle flow and mantle structure that existed in the past (Torsvik et al. 2008). During the Mesozoic an associated modeled topographic high is situated near Gondwana rifting raising the possibility that this buoyant structure may have been involved with Gondwana breakup (Conrad & Gurnis 2003). Burke et al. (2008) have shown that LIP eruption sites of the past 300 My lie vertically above the horizontal edges of the African and Pacific LLSVPs at the core-mantle boundary and this spatial association is demonstrated for Gondwana break-up LIPs in Figure 6. Near the core-mantle boundary the association of the high temperature of the outer core with an inclined thermal boundary layer at the margins of LLSVPs facilitate the generation of mantle plumes in the plume generation zones (Tronnes 2010). Seismic tomography studies associated with examination of large low shear velocity provinces also indicate that whole mantle convection is occurring beneath the Pacific Ocean (Schmerr et al. 2010; Liu et al. 2011) making non-plume models significantly less tenable. Figure 6. Gondwana reconstruction for 180 Ma (modified after Pankhurst & Vaughan 2009) showing major cratons and projected outline of the African LLSVP (heavy dashed line) from Torsvik et al. (2010). Major post-Permian large igneous province centres associated with the break-up of Gondwana are marked: CAMP – Central Atlantic Magmatic Province, 200 Ma (after Marzoli et al. 1999); GLIP – Gondwana Large Igneous Province, 180 Ma (after Storey & Kyle 1997) ; C–B – Comei–Bunbury LIP, 134 Ma (after Zhu et al. 2009); E–P – Etendeka–Paraná, 132 Ma (after Peate 1997). Craton labels are after Pankhurst & Vaughan (2009) and are as follows: ANS – Arabian–Nubian Shield; AM – Amazonia; ANT – Antarctica; AUS – Australian cratons; AZ – Azania; C – Congo; GM – Goias Massif; IND – Indian cratons; K-G – Kalahari–Grunehogna; LA – Luis Alves; M – Mawson; P – Paraná; RA – Rio Apa; RP – Rio de la Plata; SF – Sao Francisco; SL – San Luis; WA – West Africa. Ideas vary on the role of mantle plumes in continental breakup, from the original active mantle hypothesis of Morgan (1971, 1981) who considered that plumes drive the plates and initiate continental breakup by doming and cracking the continents, and pushing the continents apart, to passive models, where the plume plays no part in breakup except that the chance unroofing of a pre-existing or incubating plume results in rapid outpouring of flood basalt provinces (White & McKenzie 1989). Some hybrid models combine aspects of both passive and active models, the forces that drive plate motions place the continents under tension when subduction is taking place on both sides of the continent but it is the arrival of a new plume that weakens them and causes them to split and form a new ocean (Hill 1991; Bott 1992; White 1992). With the initial breakup of Gondwana, many authors suggested that one or more centres of thermal activity responsible for the three Middle Jurassic igneous provinces (Karoo, Ferrar and Chon Aike) were situated in the Weddell Sea sector between South America, southern Africa and Antarctica (Elliott & Fleming 2000, Ferris et al. 2000, 2003; Storey & Kyle 1997; Storey et al. 2001). The thermal anomalies may have been responsible for Gondwana breakup by doming of the lithosphere and gravitational collapse leading to continental rifting (active rifting model; Storey & Kyle 1997). Storey et al. (2001) also suggested that within a regional anomaly or superplume three hotspots may have existed; beneath the Mozambique Basin (Discovery hotspot), beneath the Weddell Sea embayment region (Shona hotspot), and beneath the Dufek intrusion in the Pensacola Mountains (Bouvet hotspot). If the Weddell Sea region was the centre of magmatic activity at the time of breakup, then, in the case of the Ferrar province, magma would have been transported through dyke or sill complexes for distances in excess of 3000 kms (Fig. 1). Another intriguing aspect of the geological evolution of the Weddell Sea-South Atlantic region in the Middle Jurassic was the formation of rotated microplates (Dalziel & Elliot 1982; Mitchell et al. 1986). An Ellsworth microplate, formed at the time of breakup, rotated clockwise more than 90° and migrated from an original position between South Africa and Antarctica to its present position at the head of the Weddell Sea (Schopf 1969; Grunow et al. 1987). The Falkland Islands, like the Ellsworth Mountains, rotated 180° from a similar position between African and Antarctica to join South America on the opposite side of the Atlantic .We cannot be sure exactly how and why these microplates and rotations occurred, or why Gondwana should have broken up in this way, but it has been suggested that they were in some way linked to the formation of the volcanic province at the start of rifting and the presence of a thermal anomaly or anomalies beneath the Weddell Sea sector of Gondwana with the microplates forming on a thermal dome of the lithosphere and rotating to their present positions during sea floor spreading (Storey 1995; Storey et al. 2001). Martin (2007) provides an alternative explanation for Gondwana breakup via what he terms double-saloon-door rifting and seafloor spreading in a backarc basin during subduction rollback. Interestingly, displaced microplates are also a significant component of the final separation of South America from the Antarctic Peninsula and the opening of Drake Passage in the Scotia Sea region. The South Georgia block has moved from a position much closer to southern South America to its present position; The South Orkney block separated from the northern tip of the peninsula to form the Powell Basin, and the South Shetland Islands has separated from the peninsula by sea floor spreading in Bransfield Strait. Although the driving mechanisms may not always be the same, the history of rotated microplates has been repeated in the South Atlantic region and raises intriguing questions about breakup processes. Various other models involving mantle plumes have also been produced, most notably a plume capture model (Dalziel et al. 2000) where a mantle plume located beneath oceanic lithosphere was subducted along the active margin of Gondwana in the Permo-Triassic forming the Gondwanian fold belt, heating the Gondwana continental lithosphere ultimately leading to rifting, emplacement of LIPs and sea floor spreading. This model for the first time successfully linked the Gondwanian fold belt with the locus of rifting and the formation of the LIPs of the Karoo. It is based on a long lived mantle plume derived from a deep-seated thermal anomaly in the mantle unrelated to the insulation of continental lithosphere. There is a growing consensus that supercontinent assembly and breakup is a self-organising process (e.g. Vaughan & Storey 2007; Gutierrez-Alonso et al. 2008) largely driven by the expansion and contraction of convection cell systems in the upper mantle as their thermal evolution interacts with an overlying supercontinent and its surrounding ocean (e.g. Yoshida & Santosh 2011) or triggers deep-sourced mantle plumes (e.g. Vaughan & Storey 2007). Various models exist for modification and evolution of upper mantle convection as a result of thermal insulation by thick continental lithosphere (Anderson 1982; Trubitsyn et al. 2008; Heron & Lowman 2010), which can ultimately drive supercontinent fragmentation. However, recent modelling studies (Heron & Lowman 2011) indicate that supercontinent evolution is insufficient to change upper mantle temperatures on the timescale of supercontinent assembly and that large subcontinental mantle plumes develop as a result of subduction patterns rather than thermal insulation by supercontinents. Modelling of large low shear velocity provinces also confirms this result (Tan et al. 2011). Although the original thermal blanketing idea of Anderson (1982) was conceived prior to mantle plume theories of continental break-up (e.g. White & McKenzie 1989; Storey 1995), it has been reconciled in part with mantle plume-related mechanisms by Condie et al. (2002) and Condie (2004) via a form of the superplume event concept of Larson (1991a, 1991b; Condie et al. 2001). Convection-based models can also explain supercontinent creation by providing a convergent force, driven by large scale down-flow driven by subduction that draws continental fragments together (e.g. Yoshida & Santosh 2011). Despite the focus on upper mantle processes as the main driver for the supercontinent cycle, geological evidence suggests that lower mantle processes, hot rising plumes from the core-mantle boundary in particular, are also important (e.g. Vaughan & Livermore 2005). Upper mantle convection-driven models indicate that supercontinent formation should occur by process of "extroversion” (Murphy et al. 2009). "Extroversion" is a process of supercontinent formation that conforms to models of thermal insulation of the mantle beneath a supercontinent changing upper mantle convection (e.g. Trubitsyn et al. 2008) and driving initial supercontinent fragmentation and formation of a young internal ocean. Supercontinent fragmentation and breakup then proceeds by expansion of the internal ocean and subduction of the thermally older and colder external ocean ultimately resulting in the formation of a new supercontinent as this ocean closes (Murphy et al. 2009). In the process of "extroversion" supercontinents turn themselves inside out (Murphy & Nance 2005). Gondwana breakup conforms to the "extroversion" model with the supercontinent breaking up by formation of young internal oceans, such as the Indian and South Atlantic oceans, and consumption of exterior oceans, such as neo-Tethys or the Pacific Ocean outboard of New Zealand. The involvement of deep-sourced mantle heat in the breakup of Gondwana remains a subject of discussion (e.g. Eagles & Konig 2008; Heinonen et al. 2010), although the demonstrated coincidence between the centres of Gondwana large igneous provinces and the margins of the African LLSVP (Fig. 6) argue strongly in favour of it. Geological evidence indicates that mantle plumes were responsible for the large volumes of basaltic and silicic magmatism that erupted during the onset of breakup (e.g. Riley et al. 2003b). Recent plate kinematic analyses, however, suggest that breakup may not have been totally dependent on mantle plumes (Eagles & Konig 2008; Eagles & Vaughan 2009). It is very unlikely that a single model can explain the igneous provinces in the Mesozoic and Cenozoic history of Antarctica. However, there seems little doubt based on the presence of ferropicrites in Dronning Maud Land (DML) and the recent discovery of LLSVPs that a thermal anomaly was responsible for the DML-Karoo large igneous province, and early Cretaceous large igneous provinces associated with Gondwana breakup. The debate as to whether the anomaly was due to the insulating effect of Gondwana or due to a deep seated mantle plume has largely been resolved by the discovery of LLSVP's and the evidence they provide for a fixed long-term source for deep seated mantle plumes. The origin of the Ferrar igneous province remains an unresolved issue. It appears likely that the Weddell Sea region with its volcanic rifted margins was an important centre of magmatic activity, splitting the Karoo province into an African and Antarctic DML section. However, whether the magmas could have migrated the large distances involved to form the Ferrar province is unproven. A rift along the length of the Transantarctic Mountains driven by changes in plate boundary forces may provide a less dramatic but more compelling case. Similarly, for the Cretaceous Marie Byrd Land province, a link to subduction processes is hard to avoid, although involving the generation of hot rising plumes (Spasojevic et al. 2010). It is also possible that large igneous provinces close to active continental margins may have formed by an indirect connection to slab return flow, which may interact with a hydrated layer in the transition zone to facilitate localized upwellings along active plate margins (Faccenna et al. 2010). Whatever processes controlled or influenced the breakup of Gondwana, the supercontinent separated into the major continents as we know them today, together with rotated microplates in the Weddell Sea region. We cannot be sure exactly how and why these microplates and rotations occurred or why Gondwana should have broken up in this way, but it may in some way have been linked to the formation of the volcanic provinces at the start of rifting and the presence of a thermal anomaly beneath the Weddell Sea sector of Gondwana, with the microplates forming on a thermal dome of the lithosphere and rotating to their present positions. The trajectory, displacement history and rotation mechanisms of the micro plate component of the Gondwana jigsaw remains a mystery. As is often the case, more than one driver may ultimately be responsible for the disintegration of Gondwana. That some of these processes may be linked in a supercontinent model is also entirely feasible. However, at the present time, the evidence is leaning strongly in favour of a deep mantle origin for hot plumes as the source of the bulk of large igneous province magmatism. Periodic emplacement of LIPs during Earths history also coincided with, and possibly had a profound effect on, the environmental and climatic conditions throughout Earths history. We are also very grateful to our numerous colleagues that we have worked with on this topic over the years. Anderson, D.L. 1982. Hotspots, polar wander, Mesozoic convection and the geoid. Nature 297, 391–393. Anderson, D.L. 2000. The thermal state of the upper mantle: no role for mantle plumes. Geophysical Research Letters 27, 3623–3626. Anderson, D.L. 2005. Large igneous provinces, delamination, and fertile mantle. Elements 1, 271–275. Antonini, P., Picciirillo, E. M., Petrini, R., Civetta, L., D’Antonio, M. & Orsi, G. 1999. Enriched mantle–Dupal signature in the genesis of the Jurassic Ferrar tholeiites from Prince Albert Mountains (Victoria Land, Antarctica). Contributions to Mineralogy and Petrology 136, 1–19. Aragón, E., Rodriguez, A.M.I., & Benialgo, A. 1996. A caldera field at the Marifil Formation, new volcanogenic interpretation, North Patagonian massif, Argentina. Journal of South American Earth Sciences 9, 321–328. Behrendt, J.C., LeMasurier, W.E., Cooper, A.K., Tessensohn, F., Tréhu, A. & Damaske, D. 1991. Geophysical studies of the West Antarctic rift system. Tectonics 10, 1257–1273. Behrendt, J. C., LeMasurier, W. & Cooper, A.K. 1992. The West Antarctic Rift System—A propagating rift captured by a mantle plume? In Yoshida, K., Kaminuma, K. & Shiraishi, K. (eds) Recent Progress in Antarctic Earth Science, 315– 322, Terra Science, Tokyo. Bott, M. 1992. The styress regime associated with continental break-up. In Storey, B. C., Alabaster, T. & Pankhurst, R. J. (eds) Magmatism and the Causes of Continental Break-up. Geological Society, London, Special Publications 68, 125-136. Brewer, T. S., Hergt, J. M., Hawkesworth, C. J., Rex, D. & Storey, B. C. 1992. Coats Land dolerites and the generation of Antarctic continental flood basalts. In Storey, B., Alabaster, T. & Pankhurst, R. (eds) Magmatism and the Causes of Continental Break-up. Geological Society, London, Special Publication 68, 185–208. Bryan, S.E., Riley T.R., Jerram, D.A., Stephens, D.J. & Leat, P.T. 2002. Silicic volcanism: An undervalued component of large igneous provinces and volcanic rifted margins. Geological Society of America Special Paper 362, 97-118. Bryan, S.E., Peate, I.U., Peate, D.W., Self, S., Jerram, D.A., Mawby, M.R., Marsh, J.S. & Miller, J.A. 2010. The largest volcanic eruptions on Earth. Earth-Science Reviews, 102 (3–4), 207–229. Burke, K., Steinberger, B., Torsvik, T.H. & Smethurst, M.A. 2008. Plume Generation Zones at the margins of Large Low Shear Velocity Provinces on the core–mantle boundary. Earth and Planetary Science Letters 265, 49–60. Caldeira, K.G. & Rampino, M.R. 1990. Deccan volcanism, greenhouse warming, and the Cretaceous Tertiary boundary. In Sharpton, V.L. & Ward, P.D. (eds) Global Catastrophes in Earth history. Geological Society of Ameica Special Paper 247, 117–123. Coltice, N., Phillips, B.R., Bertrand, H., Ricard, Y. & Rey, P. 2007. Global warming of the mantle at the origin of flood basalts over supercontinents. Geology 35, 391-394. Coltice, N., Bertrand, H., Rey, P., Jourdan, F., Phillips, B.R. & Ricard, Y. 2009. Global warming of the mantle beneath continents back to the Archaean. Gondwana Research 15, 254-266. Condie, K.C. 2004. Supercontinents and superplume events: distinguishing signals in the geologic record. Physics of the Earth and Planetary Interiors 146 (1–2), 319–332. Condie, K.C., Marais, D.J.D. & Abbott, D. 2001. Precambrian superplumes and supercontinents: a record in black shales, carbon isotopes, and paleoclimates? Precambrian Research 106 (3–4), 239–260. Condie, K.C., Abbott, D. & Des Marais, D.J. 2002. Superplume events in Earth history: causes and effects - preface. Journal of Geodynamics 34 (2), 159–162. Conrad, C.P. & Gurnis, M. 2003. Seismic tomography, surface uplift, and the breakup of Gondwanaland: Integrating mantle convection backwards in time. Geochemistry Geophysics Geosystems 4(3), 1031, doi:10.1029/2001GC000299. Courtillot, V. & Renne, P.R. 2003. On the ages of flood basalt events. Compte Rendus –Académie des sciences 335, 113-140. Cox, K.G. 1988. The Karoo province. In MacDougall, J.D. (ed) Continental Flood Basalts, 239-271, Kluwer Academic Publishers, Dordrecht. Cox, K. G. 1992. Karoo igneous activity, and the early stages of the break-up of Gondwanaland. In Storey, B. C., Alabaster, T. & Pankhurst, R. J. (eds) Magmatism and the Causes of Continental Break-up. Geological Society, London, Special Publications 68, 137–148. Curtis, M.L., Riley, T.R., Owens, W.H., Leat, P.T. & Duncan, R.A. 2008. The form, distribution and anisotropy of magnetic susceptibility of Jurassic dykes in H.U. Sverdrupfjella, Dronning Maud Land, Antarctica. Implications for dyke swarm emplacement. Journal of Structural Geology 30, 1429-1447. Dalziel, I.W.D. & Elliot. D.H. 1982. West Antarctica: Problem child of Antarctica. Tectonics 1, 3-19. Dalziel, I.W.D., De Wit, M. J. & Palmer, K.F. 1974. Fossil marginal basin in the southern Andes. Nature, London 250 (5464), 291-4. Dalziel, I.W.D., Lawver, L.A. & Murphy, J.B. 2000. Plumes, orogenesis, and supercontinental fragmentation. Earth and Planetary Science Letters 178 (1–2), 1–11. Davies, H.J. & Bunge, H.P. 2006. Are splash plumes the origin of minor hotspots? Geology 34, 349–352, doi: 10.1130/G22193.1. Davis, J.M., Elston, W.E. & Hawkesworth, C.J. 1993. Basic and intermediate volcanism of the Mogollon-Datil volcanic field: Implications for mid-Tertiary tectonic transitions in southwestern New Mexico, USA. In Prichard, H.M., Alabaster, T., Harris, N.B.W. & Neary, C.R. (eds) Magmatic processes and plate tectonics Geological Society London Special Publication 76, 469–488. Eagles, G. & Konig, M. 2008. A model of plate kinematics in Gondwana breakup. Geophysical Journal International 173 (2), 703-717. Eagles, G. & Vaughan, A.P.M. 2009. Gondwana breakup and plate kinematics: Business as usual. Geophysical Research Letters 36, 10.1029/2009gl037552. Elkins-Tanton, L.T. 2005. Continental magmatism caused by lithospheric delamination. In Foulger, R., Natland, J.H., Presnall, D.C. & Anderson, D.L. (eds) Plates, Plumes, and Paradigms. 449–461. Geological Society of America, Special Publication, 388. Ellam, R. M., Carlson, R. W. & Shirley, S. B. 1992. Evidence from Re–Os isotopes for plume–lithosphere mixing in Karoo flood basalt genesis. Nature 359, 718–721. Elliot, D. H. & Fleming, T. H. 2000. Weddell triple junction: the principal focus of Ferrar and Karoo magmatism during initial breakup of Gondwana. Geology 28, 539-542. Elliot, D.H. & Fleming, T.H. 2004. Occurrence and dispersal of magmas in the Jurassic Ferrar large igneous province, Antarctica. Gondwana Research 7, 223-237. Elliot, D.H. & Hanson, R.E. 2001. Origin of widespread, exceptionally thick basaltic phreatomagmatic tuff breccia in the Middle Jurassic Prebble and Mawson Formations, Antarctica. Journal of Volcanology and Geothermal Research 111 (1–4), 183–201. Elliot, D. H., Fleming, T. H., Kyle, P. R. & Foland, K. A. 1999. Long-distance transport of magmas in the Jurassic Ferrar large igneous province, Antarctica. Earth and Planetary Science Letters 167, 89-104. Encarnación, J., Fleming, T. H., Elliot, D. H. & Eales, H. V. 1996. Synchronous emplacement of Ferrar and Karoo dolerites and the early breakup of Gondwana. Geology 24, 535-538. Erba, E. 2004. Calcareous nannofossils and Mesozoic oceanic anoxic events. Marine Micropaleontology 52 (1-4), 85–106. Erlank, A. J. 1984. Petrogenesis of the Volcanic Rocks of the Karoo Province. Johannesburg: Geological Society of South Africa, Special Publications 13. Faccenna, C. & Becker, T.W. 2010. Shaping mobile belt from small scale convection. Nature, 465, doi:10.1038/nature09064. Faccenna, C., Becker, T.W., Lallemandc, S., Lagabriellec, Y. Funiciellod, F. & Piromallo, C. 2010. Subduction-triggered magmatic pulses: A new class of plumes? Earth and Planetary Science Letters, 299, 54-68. Faure, G., Bowman, J. R., Elliot, D. H. & Jones, L. M. 1974. Strontium isotope composition and petrogenesis of the Kirkpatrick Basalt, Queen Alexandra Range, Antarctica. Contributions to Mineralogy and Petrology 48, 153–169. Féraud, G., Alric, V., Fornari, M., Bertrand, H. & Haller, M. 1999. 40Ar/39Ar dating of the Jurassic volcanic province of Patagonia: migrating magmatism relating to Gondwana break-up and subduction. Earth and Planetary Science Letters 172, 83-96. Ferraccioli, F., Coren, F., Bozzo, E., Zanolla, C., Gandolfi, S., Tabacco, I. & Frezzotti, M. 2001. Rifted(?) crust at the East Antarctic Craton margin: gravity and magnetic interpretation along a traverse across the Wilkes Subglacial Basin region. Earth and Planetary Science Letters 192 (3), 407–421. Ferris, J., Johnson, A. & Storey, B.C. 1998. Form and extent of the Dufek intrusion, Antarctica, from newly compiled aeromagnetic data. Earth and Planetary Science Letters 154, 185-202. Ferris, J., Vaughan, A.P.M. & Storey, B.C. 2000. Relics of a complex triple junction in the Weddell Sea embayment, Antarctica. Earth and Planetary Science Letters 178, 215-230. Finn, C.A., Muller, R.D. & Panter, K.S. 2005. A Cenozoic diffuse alkaline magmatic province (DAMP) in the southwest Pacific without rift or plume origin. Geochemistry Geophysics Geosystems 6, Q02005, 10.1029/2004gc000723, 26 pp. Fitton, J.G., James, D., Kempton, P.D., Ormerod, D.S., & Leeman, W.P. 1988. Role of lithospheric mantle in the generation of Late Cenozoic basic magmas in the western U.S. In Menzies, M.A. & Cox, K.G. (eds) Oceanic and continental lithosphere: Similarities and differences Journal of Petrology Special Volume 331–349. Fleming, T.H., Elliot, D.H., Jones, J.M., Bowman, J.R. & Siders, M.A. 1992. Chemical and isotopic variaitions in an iron-rich flow from the Kirkpatrick Basalt, north Victoria Land, Antarctica: implication for low-temperature alteration. Contributions to Mineralogy and Petrology 73, 105-117. Foulger, G.R. 2007. The "plate" model for the genesis of melting anomalies. In Foulger G.R. & Jurdy, D.M. (eds) Plates, Plumes, and Planetary Processes 1-28. Geological Society of America, Special Paper 430. Foulger, G.R., Natland, J.H., Presnall, D.C., & Anderson, D.L. 2005. (eds) Plates, Plumes, and Paradigms. Geological Society of America, Special Publication 388. Gibson, S.A., Thompson, R.N. & Dickin, A.P. 2000. Ferropicrites: geochemical evidence forFe-rich streaks in upwelling mantle plumes. Earth and Planetary Science Letters 174, 355-374. Ghosh, A. & Holt, W.E. 2012. Plate motions and stresses from global dynamic models. Science, 335 (6070), 838-843. Grunow, A.M., Kent, D.V. & Dalziel, I.W.D. 1987. Evolution of the Weddell Sea basin: New palaeomagnetic constraints. Earth Planetary Science Letters 86, 16 – 26. Gurnis, M. 1988. Large-scale mantle convection and the aggregation and dispersal of supercontinents. Nature 332, 695-699. Gutierrez-Alonso, G., Fernandez-Suarez, J., Weil, A.B., Murphy, J.B., Nance, R.D., Corfu, F. & Johnston, S.T. 2008. Self-subduction of the Pangaean global plate. Nature Geoscience 1 (8), 549-553. Hallam, A. & Wignall, P.B. 1999. Mass extinctions and sea-level changes. Earth-Science Reviews 48 (4), 217–250. Hart, S. R., Hauri, E.H., Oschmann, L.A. & Whitehead, J.A. 1992. Mantle plumes and entrainment: Isotopic evidence. Science 256 (5056), 517–520. Hart, S. R., Blusztajn, J. & Craddock, C. 1995, Cenozoic volcanism in Antarctica: Jones Mountains and Peter I Island, Geochimica Cosmochimica Acta 59(16), 3379–3388. Hart, S. R., Blusztajn, J., LeMasurier, W.E., Rex, W.C., Hawkesworth, C.E. & Arndt, N.T.E. 1997. Hobbs Coast Cenozoic volcanism: Implications for the West Antarctic rift system, Chemical Geology 139(1–4), 223–248. Heimann, A., Fleming, T.H., Elliot, D.H. & Foland, K.A. 1994. A short interval of Jurassic continental flood basalt volcanism in Antarctica as demonstrated by 40Ar/39Ar geochronology. Earth and Planetary Science Letters 121, 19-41. Heinonen, J.S. & Luttinen, A.V. 2008. Jurassic dikes of Vestfjella, western Dronning Maud Land, Antarctica: geochemical tracing of ferropicrite sources. Lithos 105, 347–364. Heinonen, J.S. & Luttinen, A.V. 2010. Mineral chemical evidence for extremely magnesian subalkaline melts from the Antarctic extension of the Karoo large igneous province. Mineralogy and Petrology 99, 201–217. Heinonen, J.S., Carlson, R.W. & Luttinen, A.V. 2010. Isotopic (Sr, Nd, Pb, and Os) composition of highly magnesian dikes of Vestfjella, western Dronning Maud Land, Antarctica: A key to the origins of the Jurassic Karoo large igneous province? Chemical Geology 277 (3-4), 227-244. Hergt, J.M. 2000. Comment on: “Enriched mantle – Dupal signature in the genesis of the Jurassic Ferrar tholeiites from Prince Albert Mountains (Victoria Land, Antarctica)” by Antonini et al. (Contributions to Mineralogy Petrology 136, 1-19). Contributions to Mineralogy Petrology 139, 240-244. Hergt, J.M., Chappell, B.W., Faure, G. & Mensing T.M. 1989b. The geochemistry of Jurassic dolerite from Portal Peak, Antarctica. Contributions to Mineralogy Petrology 102, 298-305. Hergt, J.M., Chappell, B.W., McCullagh, M.T., McDougall, I. & Chivas, T.R. 1989a. Geochemical and isotopic constraints on the origin of the Jurassic dolerites of Tasmania. Journal of Petrology 30, 841-883. Hergt, J. M., Peate, D. W. & Hawkesworth, C. J. 1991. The petrogenesis of Mesozoic Gondwana low-Ti flood basalts. Earth and Planetary Science Letters 105, 134-148. Heron, P.J. & Lowman, J.P. 2010. Thermal response of the mantle following the formation of a "super-plate". Geophysical Research Letters 37, L22302, 10.1029/2010gl045136, 4 pp. Heron, P.J. & Lowman, J.P. 2011. The effects of supercontinent size and thermal insulation on the formation of mantle plumes. Tectonophysics 510 (1-2), 28-38. Hesselbo, S.P., Grocke, D.R., Jenkyns, H.C., Bjerrum, C.J., Farrimond, P., Bell, H.S.M. & Green, O.R. 2000. Massive dissociation of gas hydrate during a Jurassic oceanic anoxic event. Nature 406 (6794), 392–395. Hesselbo, S.P., Morgans-Bell, H.S., McElwain, J.C., Rees, P.M., Robinson, S.A. & Ross, C.E. 2003. Carbon-cycle perturbation in the Middle Jurassic and accompanying changes in the terrestrial paleoenvironment. Journal of Geology 111 (3), 259–276. Hill, R.I. 1991. Starting plumes and continental break-up. Earth and Planetary Science Letters, 104, 398-416. Hofmann A. W. 1997. Mantle geochemistry: a message from oceanic volcanism. Nature 385, 219-229. Hofmann, A.W. & White, W.M. 1982. Mantle plumes from ancient continental crust. Earth Planetary Science Letters 57, 421-436. Hole, M.J. & LeMasurier, W.E., 1994. Tectonic controls on the geochemical composition of Cenozoic mafic alkaline volcanic rocks from West Antarctica. Contributions to Mineralogy and Petrology 117, 187–202. Huppert, H.E., & Sparks, R.S.J. 1988, The generation of granitic magmas by intrusion of basalt into continental crust. Journal of Petrology 29, 599–624. Johnston, S.T. & Thorkelson, D.J. 2000. Continental flood basalts: episodic magmatism above long-lived hotspots. Earth and Planetary Science Letters 175, 247–256. Kerr, A.C., Saunders, A.D., Tarney, J., Berry, N.H. & Hards, V.L. 1995. Depleted mantle-plume geochemical signature: no paradox for plume theories. Geology 23, 843-846. King, S.D. & Anderson, D.L. 1995. An alternative mechanism of flood basalt formation. Earth and Planetary Science Letters 136, 269–279. King, S.D. & Ritsema, J. 2000. African hot spot volcanism: Small-scale convection in the upper mantle beneath cratons. Science 290, 1137-1140. Kuroda, J., Ogawa, N.O., Tanimizu, M., Coffin, M.F., Tokuyama, H., Kitazato, H. & Ohkouchi, N. 2007. Contemporaneous massive subaerial volcanism and late cretaceous Oceanic Anoxic Event 2. Earth and Planetary Science Letters 256 (1-2), 211–223. Kyle, P. R. 1980. Development of heterogeneities in the subcontinental mantle: evidence from the Ferrar Group, Antarctica. Contributions to Mineralogy Petrology 73, 89-104. Kyle P.R., Elliot, D.H. & Sutter, J.F. 1981. Jurassic Ferrar Supergroup tholeiites from the Transantarctic Mountains, Antarctica, and their relation to the initial fragmentation of Gondwana. In Cresswall, M.M. & Vella, P. (eds) Gondwana Five, Proceedings of the fifth Gondwana Symposium, Wellington, New Zealand. A.A. Balkema, Rotterdam, 283-287. Kyle P.R., Pankhurst, R.J. & Bowman, J.R. 1983. Isotopic and chemical variations in Kirkpatrick Basalt Group rocks from southern Victoria Land, In Oliver, R.L., James, P.R. & Jago, J. (eds) Antarctic Earth Science, Austarlian Academy of Science, canberra, 234-237. Kyle, P.R., Pankhurst, R., Mukasa, S., Panter, K., Smellie, J. & McIntosh, W. 1994. Sr, Nd and Pb isotopic variations in the Marie Byrd Plume, West Antarctica. U.S. Geological. Survey Circular 1107, 184. Lanyon, R., Varne, R. & Crawford, A.J. 1993. Tasmanian Tertiary basalts, the Balleny Plume, and opening of the Tasman Sea southwest Pacific Ocean. Geology 21, 555–558. Larson, R.L. 1991a. Geological consequences of superplumes. Geology 19 (10), 963–966. Larson, R.L. 1991b. Latest pulse of Earth: evidence for a mid-Cretaceous superplume. Geology 19 (6), 547–550. Larson, R.L. & Kincaid, C. 1996. Onset of mid-Cretaceous volcanism by elevation of the 670 km thermal boundary layer. Geology 24 (6), 551–554. Leahy, G.M. & Bercovici, D. 2007. On the dynamics of a hydrous melt layer above the transition zone. Journal of Geophysical Research 112, B07401. Leat, P.T. 2008. On the long-distance transport of Ferrar magmas. Geological Society, London, Special Publications 302, 45-61. Leat, P.T., Riley, T.R., Storey, B.C., Kelley, S.P. & Millar, I.L. 2000. Middle Jurassic ultramafic lamprophyre dykes within the Ferrar magmatic province, Pensacola Mountains, Antarctica. Mineralogical Magazine 64, 95-111. LeMasurier, W.E. 1990. Late Cenozoic volcanism on the Antarctic Plate: an overview. In LeMasurier, W.E. & Thomson, J.W. (eds) Volcanoes of the Antarctic Plate and Southern Oceans. Antarctic Research Series 48, 1–18, AGU, Washington, D. C.
LeMasurier, W.E. & Landis, C.A. 1996. Mantle-plume activity recorded by low-relief erosion surfaces in West Antarctica and New Zealand. Bulletin Geological Society of America 108 (11), 1450–1466. LeMasurier, W. E. & Rex, D.C. 1989. Evolution of linear volcanic ranges in Marie Byrd Land, West Antarctica. Journal of Geophysical Research 94(6), 7223–7236. LeMasurier, W. E. & Thomson, J.W. 1990 (Eds) Volcanoes of the Antarctic Plate and Southern Oceans. Antarctic Research Series 48, 487 pp, AGU, Washington, D. C.
Liu, L.J., Tan, Y., Sun, D.Y., Chen, M. & Helmberger, D. 2011. Trans-Pacific whole mantle structure. Journal of Geophysical Research-Solid Earth, 116, B04306, 10.1029/2010jb007907, 14 pp. Luttinen, A.V. & Furnes, H. 2000. Flood basalts of Vestfjella: Jurassic magmatism across an Archaean-Proterozoic lithospheric boundary in Dronning Maud Land, Antarctica. Journal of Petrology 41, 1271-1305. Luyendyk, B.P. 1995. Hypothesis for Cretaceous rifting of East Gondwana caused by subducted slab capture. Geology 23 (4), 373–376. Marzoli, A., Renne, P.R., Piccirillo, E.M., Ernesto, M., Bellieni, G. & De Min, A. 1999. Extensive 200-million-year-old continental flood basalts of the Central Atlantic Magmatic Province. Science 284, 616–618. Mikhailov, V., Stephenson, R. & Diament, M. 2010. Modelling of compression and extension of the continental lithosphere: Towards rehabilitation of the necking-level model. Journal of Geodynamics 50 (5), 368-380. Mitchell, C., Taylor, G.K., Cox, K.G. & Shaw, J. 1986. Are the Falkland Islands a rotated microplate? Nature 319, 131-134. Molzahn, M., Reisberg, L. & Wörner, G. 1996. Os, Sr, Nd, Pb and O isotope and trace element data from the Ferrar flood basalts, Antarctica: evidence for an enriched subcontinental lithospheric source. Earth and Planetary Science Letters 144, 529-546. Montelli, R., Nolet, G., Dahlen, F.A., Masters, G., Engdahl, E.R. & Hung, S-H. 2004. Finite frequency tomography reveals a variety of plumes in the mantle. Science 303 (5656), 338-343. Montelli, R., Nolet, G., Dahlen, F.A. & Masters, G. 2006. A catalogue of deep mantle plumes: New results from finite-frequency tomography. Geochemistry Geophysics Geosystems 7, Q11007, 10.1029/2006gc001248, 69 pp. Morgan, W.J. 1971. Convection plumes in lower mantle. Nature 230 (5288), 42–43. Morgan, W.J. 1981. Hotspot tracks and the opening of the Indian and Atlantic Oceans. In Emiliani, C. (ed.) The Oceanic Lithosphere. Wiley, New York, 443–488. Mortimer, N., Parkinson, D., Raine, J.I., Adams, C.J., Graham, I.J., Oliver, P.J. & Palmer, K.. 1995. Ferrar magmatic province rocks discovered in New Zealand: Impications for Mesozoic Gondwana geology. Geology 23, 185-188. Murphy, J.B. & Nance, R.D. 2005. Do supercontinents turn inside-in or inside-out? International Geology Review 47 (6), 591–619. Murphy, J.B., Nance, R.D. & Cawood, P.A. 2009. Contrasting modes of supercontinent formation and the conundrum of Pangea. Gondwana Research 15 (3-4), 408-420. Pálfy, J. & Smith, P.L. 2000. Synchrony between Early Jurassic extinction, oceanic anoxic event, and the Karoo–Ferrar flood basalt volcanism. Geology 28 (8), 747–750. Pankhurst, R. J. & Rapela, C. R. 1995. Production of Jurassic rhyolites by anatexis of the lower crust of Patagonia. Earth and Planetary Science Letters 134, 23–36. Pankhurst, R.J. & Vaughan, A.P.M. 2009. The tectonic context of the Early Palaeozoic southern margin of Gondwana. In: Bassett, M.G. (ed.) Early Palaeozoic peri-Gondwana terranes: new insights from tectonics and biogeography. Geological Society, London, Special Publications, 325, 169–174. Pankhurst, R. J., Leat, P. T., Sruoga, P., Rapela, C. W., Márquez, M., Storey, B. C. & Riley, T. R. 1998. The Chon-Aike silicic igneous province of Patagonia and related rocks in Antarctica: a silicic large igneous province. Journal of Volcanology and Geothermal Research 81, 113-136. Pankhurst, R. J., Riley, T. R., Fanning, C. M. & Kelley, S. P. 2000: Episodic silicic volcanism in Patagonia and the Antarctic Peninsula: chronology of magmatism associated with break-up of Gondwana. Journal of Petrology 41, 605-625. Panter, K., Blusztajn, J., Hart, S.R. & Kyle, P. 1997. Late Cretaceous-Neogene basalts from Chatham Island: Implications for HIMU mantle beneath continental borderlands of the Southwest Pacific. In Seventh Annual V. M. Goldschmidt Conference, LPI Contribution. 921, 156–157, Lunar and Planetary Institute, Houston, Texas. Panter, K.S., McIntosh, W.C. & Smellie, J.L. 1994. Volcanic history of Mount Sidley, a major alkaline volcano in Marie Byrd Land, Antarctica. Bulletin Volcanology 56, 361–376. Panter, K. S., Hart, S.R., Kyle, P., Blusztajn, J. & Wilch, T. 2000. Geochemistry of Late Cenozoic basalts from the Crary Mountains: Characterization of mantle sources in Marie Byrd Land, Antarctica. Chemical Geology 165, 215–241. Peate, D.W. 1997. The Parana-Etendeka Province. In: Mahoney, J.J. & Coffin, M.R. (eds) Large igneous provinces: continental, oceanic, and planetary flood volcanism. AGU Geophysical Monograph, 100, 217–244. Rey, P.F. & Mueller, R.D. 2010. Fragmentation of active continental plate margins owing to the buoyancy of the mantle wedge. Nature Geoscience 3 (4), 257-261. Richards, M.A., Duncan, R.A. & Courtillot, V.E. 1989. Flood basalts and hot-spot tracks: plume heads and tails. Science 246 (4926), 103-107. Riley, T.R. & Knight, K.B. 2001. Age of pre-break-up Gondwana magmatism: a review. Antarctic Science 13, 99-110. Riley, T. R. & Leat, P. T. 1999. Large volume silicic volcanism along the proto-Pacific margin of Gondwana: lithological and stratigraphcial investigations from the Antarctic Peninsula. eological Magazine 136, 1-16. Riley, T. R., Leat, P. T., Pankhurst, R. J. & Harris, C. 2001. Origins of large volume rhyolitic volcanism in the Antarctic Peninsula and Patagonia by crustal melting. Journal of Petrology 42, 1043-1065. Riley, T.R., Leat, P.T., Storey, B.C., Parkinson, I.J. & Millar, I.L. 2003b. Ultramafic lamprophyres of the Ferrar large igneous province: evidence for a HIMU mantle component. Lithos 66 (1–2), 63–76. Riley, T. R., Millar, I. L., Watkeys, M. K., Curtis, M. L., Leat, P. T., Klausen, M. B. & Fanning C. M. 2004. U-Pb zircon (SHRIMP) ages for the Lebombo rhyolites, South Africa: refining the duration of Karoo volcanism. Journal of the Geological Society, London 161, 542-545. Riley, T. R., Leat, P. T., Curtis, M. L., Millar, I. L. & Fazel., A. 2005. Early-Middle Jurassic dolerite dykes from western Dronning Maud Land (Antarctica): identifying mantle sources in the Karoo large igneous province. Journal of Petrology 46, 1489-1524. Riley, T. R., Curtis, M. L., Leat, P. T., Watkeys, M.K., Duncan, R.A., Millar, L. L. & Owens, W.H. 2006. Overlap of Karoo and Ferrar magma types in KwaZulu-Natal, South Africa. Journal of Petrology 47, 541-556. Rocchi, S., Armienti, P., D’Orazio, M., Tonarini, S., Wijbrans, J.R. & Di Vincenzo, G. 2002. Cenozoic magmatism in the western Ross Embayment: Role of mantle plume versus plate dynamics in the development of the West Antarctic Rift System. Journal Geophysical Research 107(B9), 2195, doi:10.1029/2001JB000515. Rocchi, S., Storti, F., Di Vincenzo, G. & Rossetti, F. 2003, Intraplate strike-slip tectonics as an alternative to mantle plume activity for the Cenozoic rift magmatism in the Ross Sea region, Antarctica, in Intraplate Strike-Slip Deformation Belts. In Storti, F., Holdsworth, R.E. & Salvini, F. (eds) Geological Society London Special Publication 210, 145–158. Rocchi, S., Di Vincenzo, G. & Armienti, P. 2005. No plume, no rift magmatism in the West Antarctic rift. In: Foulger, G.R., Anderson, D.L., Natland, J.H. & Presnall, D.C. (Eds) Plates, Plumes & Paradigms: SGA Special Paper 388, 435–447. Rocholl, A., Stein, M., Molzahn, M., Hart, S.R. & Worner G. 1995. Geochemical evolution of rift magmas by progressive tapping of a stratified mantle source beneath the Ross Sea Rift, northern Victoria Land, Antarctica. Earth and Planetary Science Letters 131(3–4), 207–224. Rosenbaum, G., Weinberg, R.F. & Regenauer-Lieb, K. 2008. The geodynamics of lithospheric extension. Tectonophysics 458 (1-4), 1-8. Ross, P.S., Peate, I.U., McClintock, M.K., Xu, Y.G., Skilling, I.P., White, J.D.L. & Houghton, B.F. 2005. Mafic volcaniclastic deposits in flood basalt provinces: A review. Journal of Volcanology and Geothermal Research 145 (3–4), 281–314. Rowley, P.D., Schmidt, D.L. & Williams. P.L. 1982. The Mount Poster Formation, southernm Antarctic Peninsula. Antarctic Journal of United States 17 (5), 38-39. Salvini, F., Brancolini, G., Busetti, M., Storti, G., Mazzarini, F. & Coren, F. 1997. Cenozoic geodynamics of the Ross Sea region, Antarctica: crustal extension, intraplate strike-slip faulting, and tectonic inheritance. Journal Geophysical Research 102(B11), 24,669– 24,696, doi:10.1029/97JB01643. Schmerr, N., Garnero, E. & McNamara, A. 2010. Deep mantle plumes and convective upwelling beneath the Pacific Ocean. Earth and Planetary Science Letters, 294 (1-2), 143-151. Schopf, J.M. 1969. Ellsworth Mountains: position in West Antarctica due to sea floor spreading. Science 164, 63-66. Self, S., Widdowson, M., Thordarson, T. & Jay, A.E. 2006. Volatile fluxes during flood basalt eruptions and potential effects on th eglobal environment: A Deccan perspective. Earth Planetary Science Letters 248, 518-532. Siddoway, C. 2010. Tectonics: Microplate motion. Nature Geoscience, 3 (4), 225-226. Sigloch K., McQuarrie, N. & Nolet, G. 2008. Two-stage subduction history under North America inferred from multiple-frequency tomography. Nature Geoscience 1 458–462. Spasojevic, S., Gurnis, M. & Sutherland, R. 2010. Inferring mantle properties with an evolving dynamic model of the Antarctica-New Zealand region from the Late Cretaceous. Journal of Geophysical Research-Solid Earth, 115, B05402, 10.1029/2009jb006612, 16 pp. Steinberger, B. & Torsvik, T.H. 2012. A geodynamic model of plumes from the margins of Large Low Shear Velocity Provinces. Geochemistry Geophysics Geosystems, Q01w09, 10.1029/2011gc003808, 17 pp. Storey, B.C. 1995. 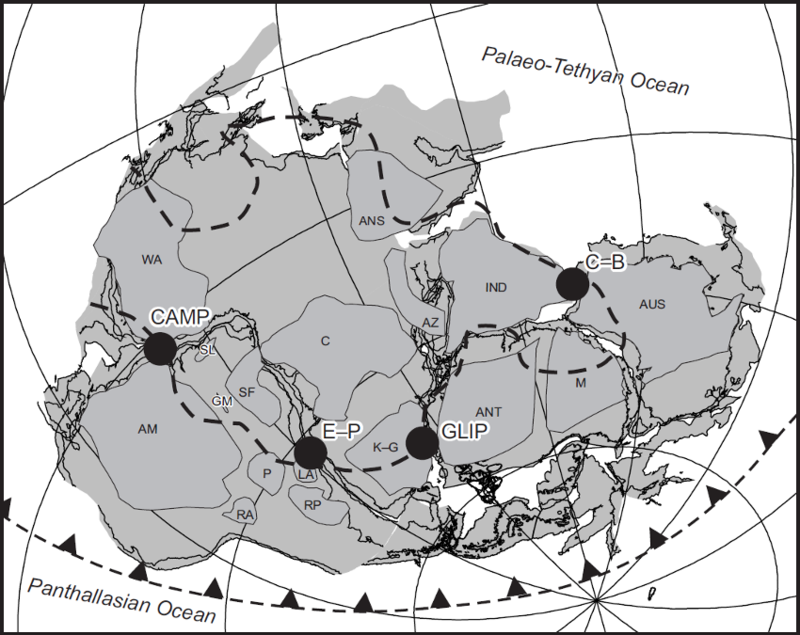 The role of mantle plumes in continental breakup: case histories from Gondwanaland. Nature 377 (6547), 301–308. Storey, B.C. & Kyle, P.R. 1997. An active mantle mechanism for Gondwana breakup. South African Journal of Geology 100 (4), 283–290. Storey, B.C., Hole, M.J., Pankhurst, R.J., Millar, I.L. & Vennum, W.R. 1988. Middle Jurassic within plate granites in West Antarctica and their bearing on the break-up of Gondwanaland. Journal Geological Society London 145, 999-1007. Storey, B. C., Leat, P.T., Weaver, S.D., Pankhurst, R.J., Bradshaw, J.D. & Kelley, S. 1999. Mantle plumes and Antarctica-New Zealand rifting: Evidence from Mid-Cretaceous mafic dykes. Journal Geological Society London 156 (4), 659–671. Storey, B.C., Leat, P.T. & Ferris, J.K. 2001. The location of mantle-plume centers during the initial stages of Gondwana break-up. In: Ernst, R.E. & Buchan, K.L. (eds) Mantle Plumes: Their identification through time. Geological Society of America Special Papers 352, 71–80. Stump, E. 1995. The Ross Orogen of the Transantarctic Mountains. Cambridge University Press, Cambridge. Sutherland, R., Spasojevic, S. & Gurnis, M. 2010. Mantle upwelling after Gondwana subduction death explains anomalous topography and subsidence histories of eastern New Zealand and West Antarctica. Geology 38 (2), 155-158. Sweeney, R. J., Duncan, A. R. & Erlank, A. J. 1994. 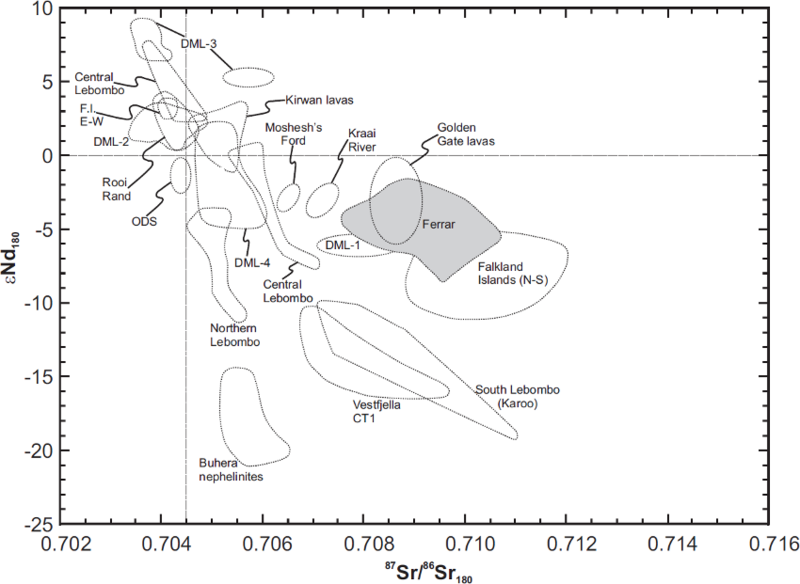 Geochemistry and petrogenesis of central Lebombo basalts of the Karoo igneous province. Journal of Petrology 35, 95–125. Tan, E., Leng, W., Zhong, S.J. & Gurnis, M. 2011. On the location of plumes and lateral movement of thermochemical structures with high bulk modulus in the 3-D compressible mantle. Geochemistry Geophysics Geosystems, 12.
ten Brink, U. S., Bannister, S., Beaudoin, B.C. & Stern, T.A. 1993, Geophysical investigations of the tectonic boundary between East and West Antarctica. Science, 261(5117), 45–50. Thompson, R.N. & Gibson, S.A. 2000. Transient high temperatures in mantle plume heads inferred from magnesian olivines in Phanerozoic picrites. Nature 407, 502–506. Torsvik, T.H., Smethurst, M.A., Burke, K. & Steinberger, B. 2008. Long term stability in deep mantle structure: Evidence from the similar to 300 Ma Skagerrak-Centered Large Igneous Province (the SCLIP). Earth and Planetary Science Letters 267 (3-4), 444–452. Trubitsyn, V.P., Mooney, W.D. & Abbott, D.H. 2003. Cold cratonic roots and thermal blankets: how continents affect mantle convection. International Geology Review 45 (6), 479–496. van der Hilst, R.D., Widiyantoro, S. & Engdahl, E.R. 1997. Evidence for deep mantle circulation from global tomography. Nature 386 (6625), 578–584. Vaughan, A.P.M. 1995. Circum-Pacific mid-Cretaceous deformation and uplift: a superplume-related event? Geology 23 (6), 491–494. Vaughan, A.P.M. & Livermore, R.A. 2005. Episodicity of Mesozoic terrane accretion along the Pacific margin of Gondwana: implications for superplume-plate interactions. In: Vaughan, A.P.M., Leat, P.T. & Pankhurst, R.J. (eds) Terrane Processes at the Margins of Gondwana. Geological Society, London, Special Publication 246, 143–178. Vaughan, A.P.M. & Storey, B.C. 2007. A new supercontinent self-destruct mechanism: evidence from the Late Triassic–Early Jurassic. Journal of the Geological Society, London 164, 383–392. Wang, Y. & Wen, L.X. 2004. Mapping the geometry and geographic distribution of a very low velocity province at the base of the Earth's mantle. Journal of Geophysical Research-Solid Earth 109 (B10), art. no.–B10305. West J.D., Fouch, M.J., Roth, J.B. & Elkins-Tanton, L.T. 2009.Vertical mantle flow associated with a lithospheric drip beneath the Great Basin, Nature Geoscienc 2 439–444. Weaver, S. D., Storey, B.C., Pankhurst, R.J., Mukasa, S.B., DiVenere, V.J. & Bradshaw, J.D. 1994. Antarctica–New Zealand rifting and Marie Byrd Land lithospheric magmatism linked to ridge subduction and mantle plume activity. Geology 22, 811–814. Wever, H.E. & Storey, B.C. 1992. Bimodal magmatism in northest Palmer Land, Antarctic Peninslua: geochemical evidence for a Jurassic ensialic back-arc basin. Tectonophysics 205, 239-259. White, R.S. 1992. Magmatism during and after continental break-up. In: Storey, B. C., Alabaster, T. & Pankhurst, R. J. (eds) Magmatism and the Causes of Continental Break-up. Geological Society, London, Special Publications 68, 1-16. White, R.S. & McKenzie, D.P. 1989. Magmatism at rift zones: the generation of volcanic continental margins and flood basalts. Journal of Geophysical Research-Solid Earth, 94 (B6), 7685–7729. Wilson, T.J. 1963. A possible origin of the Hawaiian Islands. Canadian Journal of Physics 41, 863–870. Wilson, M. & Downes, H. 2006. Tertiary–Quaternary intra-plate magmatism in Europe and its relationships to mantle dynamics. In: Gee, D. & Stephenson, R. (Eds. ), European Lithosphere Dynamics. Geological Society London Memoir 32, 147–166. Wooden, J.L. Czamanske, G.K., Federenko, V.A., Arndt, N.T., Chauvel, C., Bouse, R.M., King, B.W., Knight, R.J. & Siems, D.F. 1993. Isotopic and trace element constraints on mantle and crustal contributions to Siberian continental flood basalts, Noril’sk area, Siberia. Geochimica et Cosmochimica Acta 57, 3677-3704. Yoshida, M. & Santosh, M. 2011. Supercontinents, mantle dynamics and plate tectonics: A perspective based on conceptual vs. numerical models. Earth-Science Reviews 105 (1-2), 1-24. Zhu, D.C., Chung, S.L., Mo, X.X., Zhao, Z.D., Niu, Y.L., Song, B. & Yang, Y.H. 2009. The 132 Ma Comei-Bunbury large igneous province: Remnants identified in present-day southeastern Tibet and southwestern Australia. Geology, 37 (7), 583-586.